Ideally, for example, we would want something like medicine catering to the biggest areas of diseases and so on – but as has been highlighted in recent papers on biomedical ethics, research into diseases that effect mostly Third World countries are not lucrative for so-called Big Pharma. There is evidence to support this thesis, but not enough for us to think in conspiracy theory tones. Furthermore there are shades of grey depending how we define “interest”. Anyway, what I’m focused on now is how to balance this idea of “opinion”. 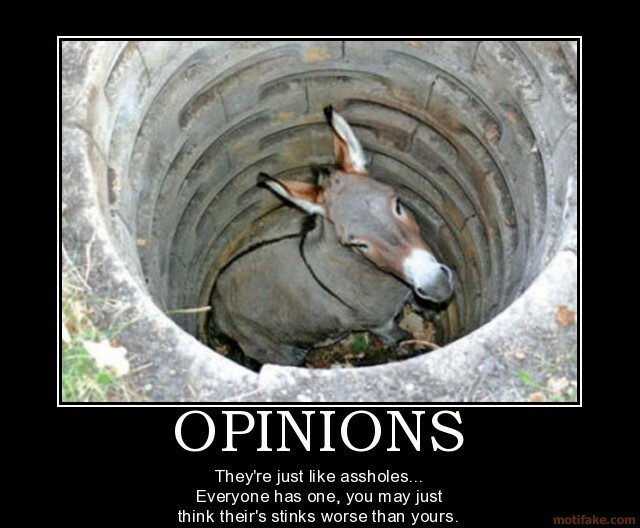 The Web has allowed nobodies like me to voice their “opinion” on almost all matters. Many who are capable of putting words coherently after each other can voice their political, religious, economic, and other views to rage against the dying light of expertise. No longer is it the case that we focus on expert opinion on matters; now we can read others who perhaps are more eloquent but lacking in intellectual substance. The danger of ignoring Joe Blogs from voicing his opinion is that we only hear from Prof. Expert who may be wrong. Plenty of experts in various fields have voiced views that aligned themselves to shady political agendas – everything from apartheid or racist policies to even concessions on recent, important positions in a Third World Country. Joe Blogs and friends might be the voice of a minority ignored, the group history will applaud as heroes, liberators and defenders of justice, truth and other important-sounding words. History, as ever, is a guide. We can’t and should not ignore opinions from a diverse range. However, what should matter is the quality of the opinion. The major element of expert opinion is not that it’s said by experts, but that it is, in itself, a sound, logical, evidence-backed opinion. We do expect experts to automatically have ‘good’ opinions, but perhaps we should be rescinding from this automatic assumption given what history and the present confirm: that experts can be and are sometimes wrong. I don’t think we should give weight automatically to ‘expert’ opinions anymore. Just because someone is, say, a highly-regarded medical doctor doesn’t mean he has anything good arguments when debating evolution. Unfortunately, many people think obtaining a PhD or having “doctor” before your name grants you some automatic intellectual licence to speak on all matters. This is, of course, nonsense. The only intellectuals who can legitimately speak on nearly all matters with consistently good arguments are philosophers, of course (I’m kidding, by the way). But, the point is I think we should stop looking for ‘expert’ opinion, unless we can agree that an ‘expert’ opinion means a ‘good argument’ (or view). And that means almost anyone can have them. If almost anyone can have them, then calling these ‘expert’ opinions seems to undermine the idea of experts (which would upset someone like my beloved Platonic Socrates). So I think for now, we should all strive to have good arguments and not adhere immediately to expert opinions. This also helps to lower our immediate concession to those we regard highly as being automatically brilliant in their arguments; that is, it means we can disagree with those we respect because we are disagreeing with their arguments even if we think they are brilliant men and women. The question then becomes: If using the term ‘expert opinion’ seems unhelpful, should we use it at all? I’m not sure but I’ve outlined why I think we should at least be sceptical of it and why we should rather use the idea of good and bad arguments – because this can be held by anyone. When it comes to things that legitimately require expert views, things become more complicated. For example, I could not begin to comment on anything Stephen Hawking says, but there are people who disagree with him. Who should we listen to? It seems to me, then, that it remains the job of the expert to make a good argument in as clear a way as possible and up to us, as inquirers, to obtain as much information as possible to meet him halfway. This is still difficult, but as Jethro Tull remind us, nothing is easy. This doesn’t undermine my point so much as, I think, reinforce it. Here, too, we are not immediately just resorting to a view because Stephen Hawking says so and we are ignorant of deep physics. We are holding back our view to say something like “I need more information” or “I don’t understand it enough to firmly stand on either side [assuming there’s only two sides”. And, frankly, I would rather more of us did say this sort of thing more often. I’m tired of people voicing their views on issues just because they’ve heard it from an expert or from someone with a silver tongue. A five minute probe into eloquent disquisitions can usually open up barely covered wounds of ignorance. This doesn’t make us better or smarter, only more careful. Our interlocutors may very well be right, without realising how their parroted views do overcome the criticisms we laid at their feet. But the point is, even so, it is still up to us, individually, to adhere to sound arguments, careful reasoning and not to be merely receptors to expert opinion without first wondering whether it is, most importantly, a good sound view in the first place. We don’t have time, of course; we can’t always take time out to say whether the research is true or good or well-done in some obscure investigation into an area of medicine we know nothing about. We are human. I understand. But where we can, we ought to do so and I think there are more areas where we can than we realise. When we begin our differentiation, I think we’ll see more of those areas come to light, instead of lumping all things expert into the field of all things validated. Update (19.11.2011): You almost don’t need to read my post because Jacques Rousseau has written two excellent pieces on this matter. Of course, you’ll notice I put this at the end of the post because I’m sneaky. Also, The Daily Maverick also has some of the best online comments I’ve seen on any website, in terms of clarity and intelligence. Opinions are thoughts on how an idea should move towards to a more positive end and thus measuring results against the opinions one can prove that opinions matter, can be graded, and we can gather an idea of whom to look to for better solutions. Of course this is just my opinion. An excellent read as always. I prefer to think less in terms of opinions and more in terms of storytelling. The act of expressing an opinion is an act of storytelling, and opinions themselves often rest on much larger, implied stories that may not be spelled out. I believe the only way that progress is possible is because there are certain processes that weed out inaccurate stories and reward/highlight the more accurate ones, so that science as a body of stories advances in a direction that brings greater understanding and, in my opinion more importantly, concrete material improvements. You and I still have to make the best use of our flawed individual judgments about the various stories we are presented, of course. But unless the accuracy of the story has some direct bearing on a practical decision we are making, the incentive for us to see past our biases is rarely very strong. And there are many things where, if I’m honest with myself, I’m drawn to out of more aesthetic impulses than anything. Some truly big think type nonfiction writing which I may not even buy into I may nevertheless read in large amounts because I find it very enjoyable to contemplate. Well this is weird. I look for a darwin wallpaper and find out there’s a blog with the exact same name as mine. Came to say hi. So … Hello there!